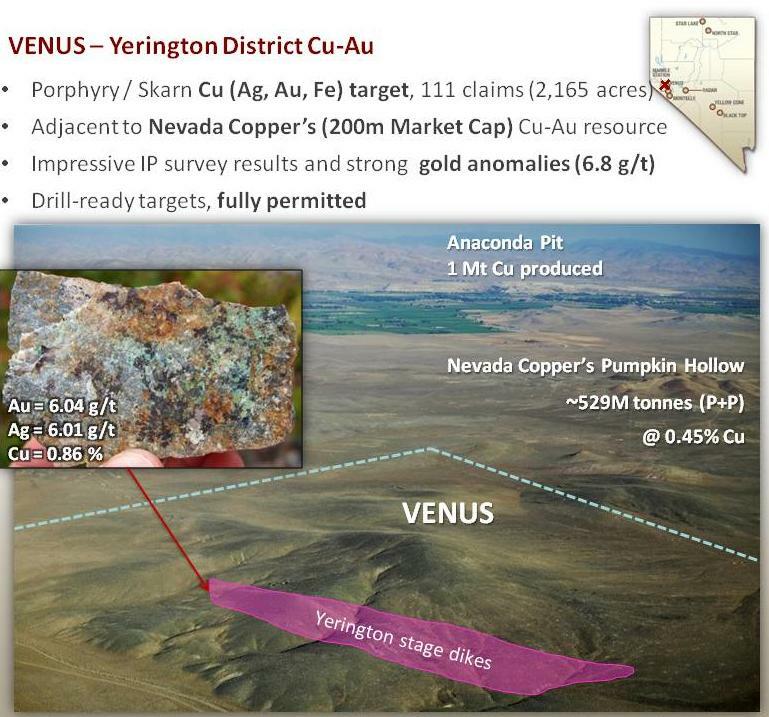 Altan Nevada’s Venus property is located in the Yerington district in western Nevada, directly adjacent to Nevada Copper Corporation’s Pumpkin Hollow copper-gold-silver-iron property, which that company is currently advancing to production. 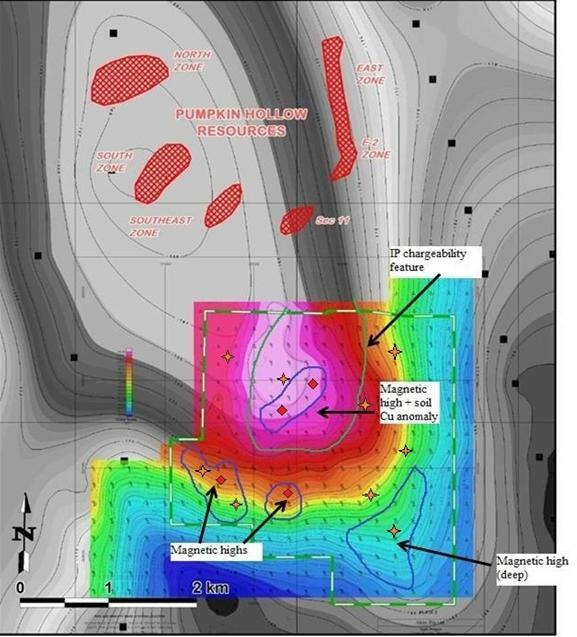 Pumpkin Hollow currently carries NI-43-101-compliant proven and probable reserves of 529.8 Mt grading 0.45% Cu and 0.058 g/tonne Au and measured and indicated resources of 515 Mt grading 0.53% Cu and 0.053 g/t Au. Measured and indicated iron resources are 395 Mt at 32.1% Fe. Rocks exposed at surface include Triassic meta-andesite to rhyolite flows, intrusives and breccias of the McConnell Canyon Formation and post-mineral Tertiary volcanic rocks. The Triassic rocks are intruded by dikes of the Jurassic Yerington batholith complex, which hosts the copper porphyry/skarn deposits in the district. During the Miocene, major normal faults rotated into subhorizontal orientations. Low angle structures of this type commonly bound individual Pumpkin Hollow ore bodies and conceptually project onto the Venus property. Red line is claim group boundary. Green and tan units in northern part of project are Triassic andesitic and felsic rocks (heavily intruded by Jurassic dikes, shown in pink). Purple, pink, brown and gray units in southern part of project are post-mineral Tertiary volcanics. Orange unit is Jurassic granodiorite. The ore body at the adjoining Pumpkin Hollow property consists of magnetite-chalcopyrite skarn emplaced proximal to the contacts of granodiorite/diorite intrusives associated with the Jurassic Yerington Batholith. 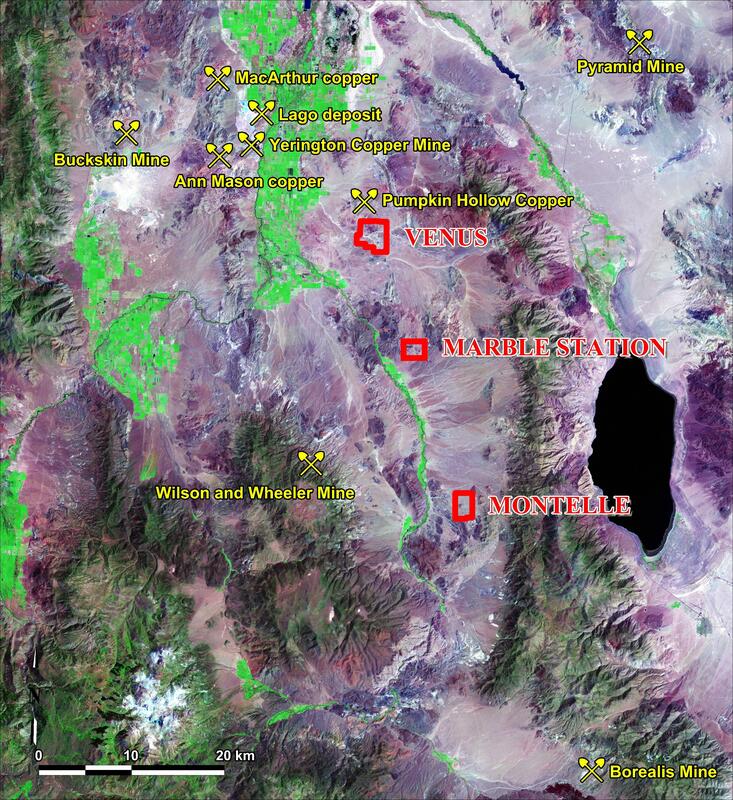 Within the Yerington district, alteration and mineralization are linked with late-stage granitic porphyry dikes similar to those mapped at surface at Venus. Mineralization, alteration, and anomalous trace element geochemistry typically found with copper and gold are present throughout Mesozoic rocks exposed at the project. Red hatched bodies are Cu-Fe (Au-Ag) skarn. 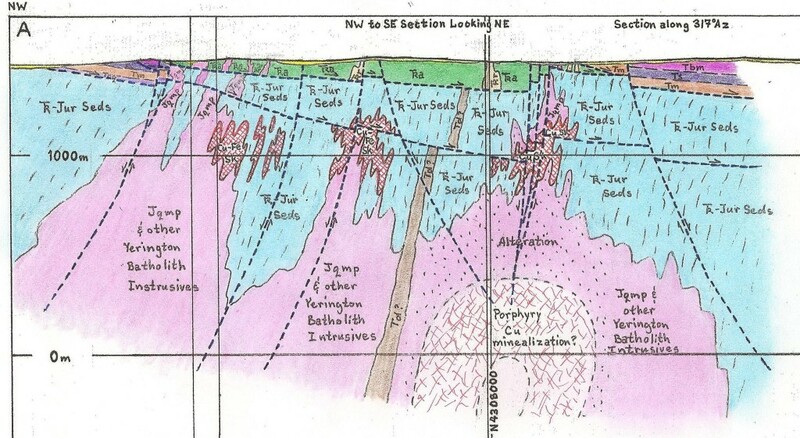 The Venus property is permissive for copper-iron-gold skarn in thrust-bounded blind carbonate blocks, porphyry copper mineralization and high grade copper-precious metals veins. Strong magnetic highs are associated with the Pumpkin Hollow mineralization. A ground magnetic survey and compilation of aeromagnetic data at Venus shows several anomalies comparable in size to the Pumpkin Hollow ore bodies. Additionally, a large gravity high, indicating a fault-bounded block of Mesozoic rocks, localizes ore at Pumpkin Hollow. This feature extends onto the Venus property. Green and white dashed line is Altan Nevada claim block. Colored image is Altan Nevada CBA gravity data (hotter colors represent denser material). Grayscale image is regional CBA gravity. Blue outlines are significant magnetic highs. Green outline is IP chargeability feature. 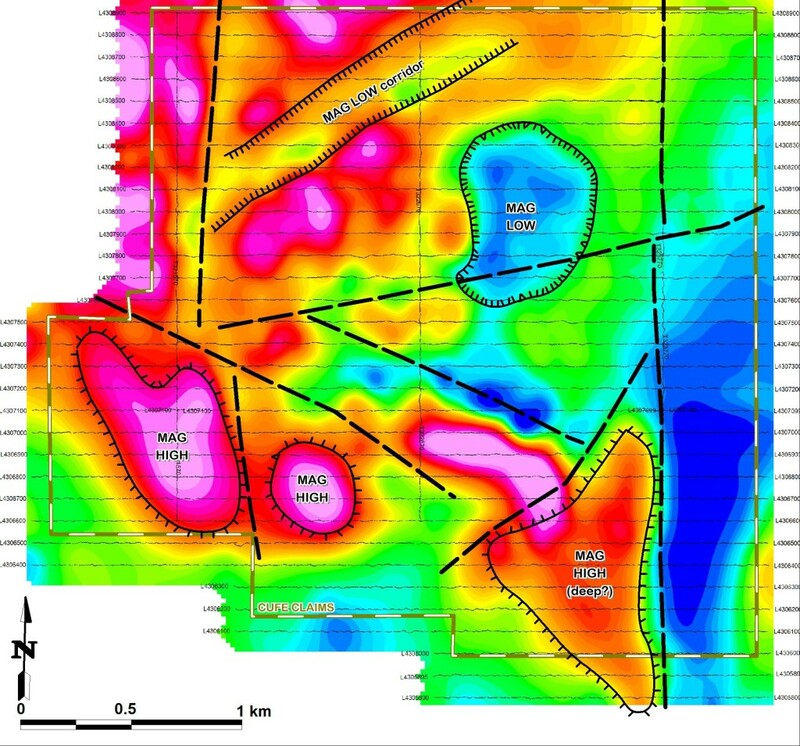 Red diamonds are preliminary Phase I drill targets; orange stars are possible Phase II targets. Detailed Interpretive Magnetic Map of the Venus Project. Altan Nevada also ran 4 IP lines (16 line-km). Zonge Geosciences merged this data with previous survey data collected by ASARCO. This IP data indicates the presence of a large chargeability anomaly in the northern portion of the Venus claim block. Zonge geophysicists interpret this feature as being present at a depth of 300 – 600 meters. Rock chip and soil sampling by Altan Nevada has revealed significant Cu, Au and Ag anomalies in areas underlain by target Mesozoic host rocks. A NE-striking magnetic fabric is spatially associated with a NE-trending Cu soil anomaly (60 to 150 ppm). This anomaly is coincident with outcropping altered Jurassic dikes which are anomalous in Au (up to 6.04 g/tonne). This geophysical-geochemical-alteration-intrusive zone, also associated with the IP chargeability anomaly, is a high priority target. In 2012 Altan Nevada conducted rock sampling in an area of gold-telluride veins along the northern border and further south in a zone of copper-stained granitic dikes. Assays confirmed elevated gold, copper and tellurium to the north and showed that the dike zone carries high copper (0.86%) and gold (6.04 g/t). These results corroborate the potential for high grade copper-precious metals veins. In 2013 the Bureau of Land Management approved a renewed Notice of Intent permit. The project is ready to drill. 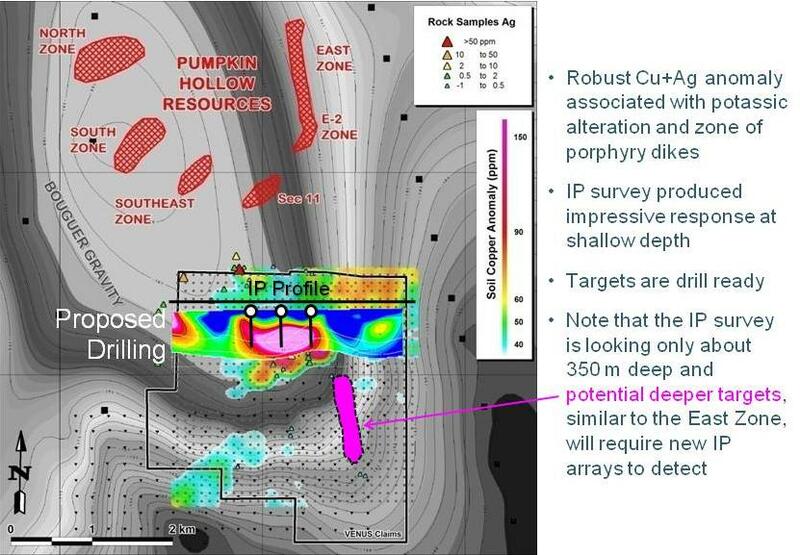 Exploration to date has generated sufficient data to prioritize first pass drill targets. The magnetic anomaly in the northern part of the claim block with the coincident IP anomaly and soil Cu anomaly represents a high priority target, along with the other magnetic anomalies associated with the large gravity anomaly. Altan Nevada management has formulated a $520,000 Phase I RC drill program to test the most prospective initial targets.